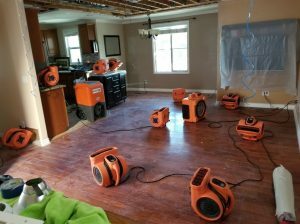 If you’ve been a property owner for any length of time you know that water damage can happen at any time from a multitude of reasons. Water damage can occur due to a ceiling leak, pipe burst, or even a leak in an appliance hose. 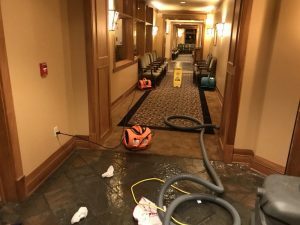 Regardless of how small or large the initial water damage is, you can count on the impact on your property to be great. Small amounts of water can hurt your appliances and furniture, but large amounts can actually damage the property itself by compromising its structural integrity. Besides the damage that water itself can bring to your property, you can also count on the likelihood of a mold infestation to occur. Damp environments are a perfect breeding ground for mold and fungi and they only need 24 hours to start growing. In addition to growing, the mold can also spread beyond the initial point of contamination. When left unchecked, mold can eat away at the organic materials on your property which includes furniture and even the sheetrock that makes up your walls. In addition, mold is also a known culprit of headaches, breathing problems, and other health concerns. We believe in providing the best customer experience possible for our King County residents. That’s why we make sure we’re available 24/7/365 to handle all of your emergency restoration needs. 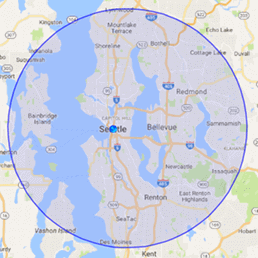 Water damage can strike hard and fast which is why we make sure to arrive within 45 minutes of your call whether you’re in Seattle, Kent, or Renton ready to get to work. If you have a need for water damage restoration or mold removal don’t wait to get help. Call 911 Restoration today for your Fresh Start. Our many years of experience have allowed us to hone our water damage restoration process to a science. No matter what the source of your water damage is, we start with a visual inspection to determine the extent of the damage. Doing this allows us to develop an action plan guaranteed to be successful. From leak to flood cleanup, we have you covered. To help us combat the water damage, we use the latest water extraction equipment along with commercial dryers to completely dry your property out. After the water is removed, repairs and reconstruction can begin on your property so that it’s even better than new. If you need water damage restoration or a flood cleanup then call 911 Restoration today. We’ll be there within 45 minutes ready to get to work. Get your Fresh Start today! It’s important to remember that cleaning the mold yourself is ill-advised. Mold spores are easily agitated and can become airborne when this happens. Not only does it get in your lungs, but it can also spread the area of contamination further than the initial point of origin. That’s why we use the latest containment measures before we even begin the actual mold removal process. After containment, we start working on decontamination. Thanks to our commercial grade cleaners and detergents we can ensure that all traces of mold get removed the first time. In the event that you are suffering from health problems or are concerned, we also offer mold testing to ensure that the mold we find isn’t toxic mold. Some strains can be extra harmful, which is why we take your safety seriously during the mold remediation. Our competitive pricing combined with our thorough approach will ensure an experience that can’t be beaten. Call 911 Restoration today for the Fresh Start you can breathe easily in. Servicing cities of Alderwood Manor, Auburn, Bellevue, Black Diamond, Bonney Lake, Bothell, Buckley, Burien, Carnation, Cascade-Fairwood, Cottage Lake, Covington, Des Moines, Duvall, East, Hill-Meridian, East Renton Highlands, Edgewood, Edmonds, Elk Plain, Enumclaw, Everett, Fall City, Federal Way, Fife, Gilman, Hilltop, Hobart, Inglewood-Finn Hill, Issaquah, Kenmore, Kent, Kirkland, Lakeland North, Lake Stevens, Lakewood, Lynnwood, Maltby, Maple Valley, Martha Lake, Marysville, Medina, Mercer, Mill Creek, Milton, Mirrormont, Monroe, Mountlake Terrace, Mukilteo, North Bend, North Creek, Northwest Bellevue, Pacific, Paine Field-Lake Stickney, Parkland, Picnic Point-North, Lynnwood, Pierce County, Puyallup, Ravensdale, Redmond, Renton, Seattle, SeaTac, Sammamish, Shoreline, Snohomish, Snoqualmie, South Hill, Spanaway, Steilacoom, Sumner, Tacoma, Three Lakes, Tukwila, Union Hill-Novelty Hill, University Place, Vashon, West Bellevue, White Center, Wilburton, Woodinville, and surrounding areas.